Podcasts are an increasingly popular way for students to showcase their ideas independent from the classroom through an audio platform. Adrian College currently has several students and alumni who have created podcasts in their free time. Links to some of their work can be found below by clicking on their respective icons. Tad Davis is a current student majoring in business and minoring in public relations. His podcast, ‘The People’s Podcast,’ is a collaborative project focused on producing and telling human experiences and stories. They lead with their curiosity and follow it where it takes them. Natalie Dunn is an Adrian College alumni (2017) who majored in communications and minored in accounting. Her podcast, ‘Self-Care Naturally,’ is about a journey of self-care and discovery, as she takes tiny steps towards an all-natural lifestyle. Gage Dansby, a current freshman at Adrian College, is a communications major and journalism minor. 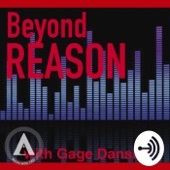 His podcast, ‘Beyond Reason,’ is a solo project with multiple interviews that center around current events in sports, news, entertainment, and technology.